This is something different from Planet Pleasures ... still all the natural components that we've grown to love and trust ... the bamboo is shredded to make it look like a party favor so there's more texture for your birds to enjoy! 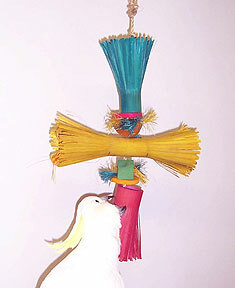 There's coconut washers, colorful corn cob pieces, oyster shell and hung from natural sisal. Greater Sulphur Crested, Sydney, is enjoying Mardi Gras.